Renaissance footwear was a far cry from the ballet flats and high heels we parade around in today. Women and men wore shoes we couldn't even comprehend pairing with our modern outfits. Read on for information regarding the innovative footwear of the middle ages. In the age of the Renaissance, women's shoes were usually made out of leather, and if they were particularly on the wealthy side, they may have been garnished with some sort of satin. Resembling slip on shoes, they were low cut on the foot, rounded at the toe, and didn't involve any sort of ties or buckles. 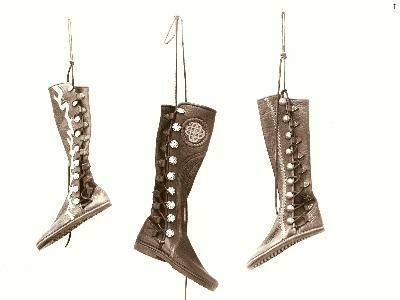 Fasteners on shoes didn't become popular until late into the 16th century. The shoes were generally thin, and were designed to slip on easily and with convenience. Since places like England are often muddy and murky, women sometimes added to their shoes an accessory known as a patten. These could be described as thick soles made of wood, and they were about an inch thick. They were fastened to the ball of the foot with a strap, and kept the portion of the shoe made of delicate fabric protected from dirt and moisture on the ground. Since the Renaissance period had a penchant for status symbols, even the shoes of various individuals worked as a declaration of a person's income and level of prestige. A higher ranking member of society would wear shoes with an obnoxious toe length. These were known as "crakows" or "poulaines," depending upon the native language of the speaker. Those of the highest levels of prestige would actually wear shoes that were up to two and a half feet long from toe to heel. Some toes were even forced to point up by attaching chains to the knee. Sound ridiculous? Not to the affluent of the middle ages. In fact, many of those living at that time may consider our trends, such as high heels or sneakers, to be equally crazy if they were to see us today! Like any other culture, Renaissance footwear was not limited to one style or fashion fad. Below is a partial list of some popular Elizabethan shoes. It is in no way complete, however it works to serve as a great example to the wide variety of footwear available around this time in history. Worn primarily by men, this shoe resembled a modern day slipper, however its tongue extended higher than the rest of the shoe. Originating around 1300 AD, this shoe was popular as a riding boot worn by clergymen. Also a boot, this one was worn lower on the foot, usually touching just above the ankle. However, some styles still reached up to calf-length. Popular in the middle ages, they originated with the Roman Caligae, and were often worn by Roman soldiers during the 1st century. These shoes were cut from only one piece of leather and bound together with laces. They were designed by the Greeks and early Celtics, however they were worn throughout the middle ages and can even be found in certain parts of Europe today. The official name used sometimes to describe the wooden strap fastened to shoes in poor weather, as described above. Is used to describe stacked leather heels favored by Queen Elizabeth, its design originating in Poland. With the popularity of Renaissance fairs and other historical reenactments, there are plenty of options when you are looking to buy authentic Renaissance footwear. Shoes of the middle ages are time consuming to make, so be prepared to splurge a little financially. They don't come cheap, however in most cases, their presentation are impressive. Armlann is one such shoe replicator able to provide you accurate footwear for your next Renaissance-themed event. You can also visit the Historical Clothing Realm if you are looking for not only shoes but full out costuming as well. A simple Google search can lead you to local stores where you can obtain the best in replicated footwear in your area.